After many customer requests, Voodoo Tactical developed the Deluxe Weapons Case in a smaller size with all the same unique features of the 42" case. The Deluxe 36" case is designed to hold two rifles (not longer than 35") and two handguns. 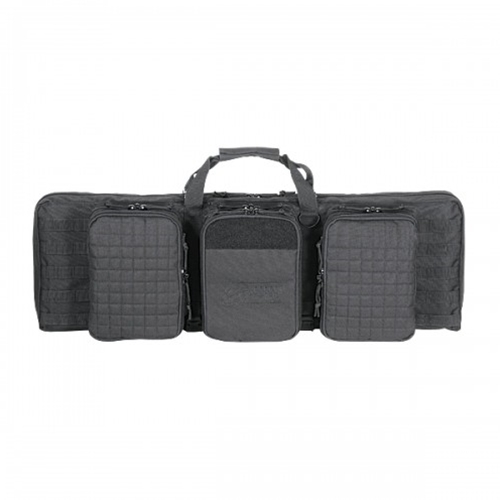 The small but mighty case also holds six 30 round rifle magazines and six pistol magazines. All rifle, pistol, and mag pouches compartments have locking zipper pulls with individual padlocks. While this bag is not equipped with backpack straps, the adjustable, removable, padded shoulder strap and the center straps that form a grab handle makes for easy carry.